1. My future house. I've noticed a serious trend in the pictures I save on pinterest for my future house. They all consist of secret hideouts and ladders and forts and various types of swings. And castles in the backyard. Because obviously I will always be 6. 2. Sister Bridget Wood's mission companion called me on the phone today to ask me a question. And yes, I DID hear that wonderful, beautiful girl's voice in the background. It made my whole day! 3. Current candy of choice: Nerds. What? I know. 4. Kittens. I admit it, I'm a cat lady. But honestly! Holy cute!! 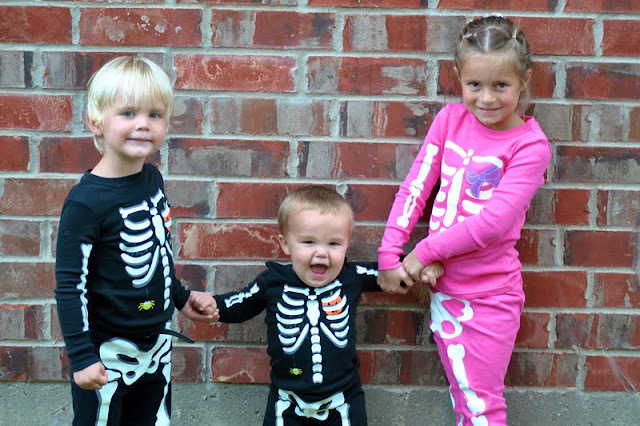 Their little skeleton pajamas glow in the dark! I love these three! And their hot mom AKA my sister. I seriously can't get enough of this picture. 6. Today I ran into Trevor on campus just out of the blue. He was walking to another class and I was on a run off in my own world, and all of a sudden... HUSBAND! I love when that happens. There's always something to like. So true, there is always something to like!! I like your pics of your future home, can I come visit?